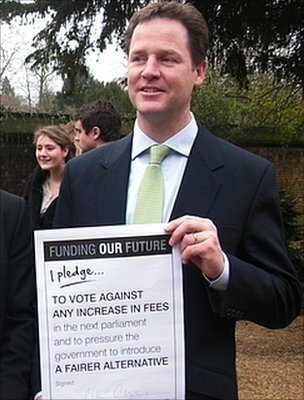 If you have a Lib Dem MP – let them know what you think of their failure to live up to the pledge they used to con people out of their votes. Shame there isn’t an offence of “obtaining votes by false pretences”. And if they reply that they are rebelling against the policy – ask them how. An abstenion is a cop-out. It is the moral equivalent of looking on while a shoplifter steals. It permits the government to achieve its ends. Only a vote against the government will achieve anything. It was a defining belief of the Twentieth Century – that education was a right to be extended to all; that through access to education people from all backgrounds would have the chance to make the most of their talents. Today we see students being priced out of those opportunities. I feel particularly strongly about the scrapping of the Educational Maintenance Allowance. My mother had to leave school, because her family needed her to bring in an income. She was capable of benefiting from further studies and attending university – but was denied it. Thankfully the Open University was created by Harold Wilson and Jennie Lee – and she had the opportunity to study for a degree. Later in life she became a respected teacher in the local school. We are going backwards if we return to the days when children are withdrawn from school because their families can’t afford to let them continue in education. The plans to raise student fees – and much of the nitty gritty detail of changes in the student loans system again are denying some young people the opportunity to achieve their potential. This isn’t a theoretical claim – a bit of scaremongering – there are young people out there who are reluntantly concluding that they can’t afford to go into Higher Education. At the same time the provision of education is being decimated. Funding for teaching at universities is being slashed. Committed educators are to be made redundant – and new recruits to teaching are being turned away. It is not only in Higher Education – but in primary and secondary education. The promotion of higher standards in core areas, although stated to be a priority, is being undermined by the destruction of teams in local authorities who are supporting teachers. One way of judging a generation – is whether they leave a better world – one with greater opportunities – for their children. In the Twentieth Century our parents enabled the extension of university education to ever greater numbers – be it through traditional universities – or through the opportunities offered by non-traditional institutions such as the Open University. We moved from a system which condemned over half the children to labelling as “incapable of extended learning” at the age of only 11 – to one where children’s different talents were nurtured, whatever age they were. We (or the State which represents us) are betraying our children. It’s time to say NO – and reassert the values of our predecessors who sought to extend opportunity. We do not exist for the benefit of the State. As citizens, the State is our servant – its purpose is to serve us, and to achieve the collective goals we have chosen. This philosophy has long been under attack. On the one hand some individuals have sought to capture “the State” and use it as a means of exercising power over their fellow citizens. Totalitarian States – like Soviet Russia or Nazi Germany are examples of this. Others have sought to strip the State of power – by turning over government to corporate interests. We are reduced to mere consumers – and power over our own lives – though the stated objective of the people pushing these ideas – is in fact diminished. WATSROC seeks to encourage people to take back control through democratic activity. The abdication of power by those how turn their backs on democratic choice (the one’s who shout that they choose “none of the above”) achieves nothing. Opting out doesn’t mean that there will be no one in government! Active citizen involvement is the only answer. It has been the inspiration for the development of Freedom in the United Kingdom – and the American Revolution. I hope that you will join in the discussions that this blog seeks to engage in – whatever political party you identify with, if any – this is a call to action which is long overdue. Please join with me to achieve the kind of state which serves its citizens.